$31.75* Huntington Beach Smog Check Coupon - Hb Smog Check Center - 17281 Beach Blvd., Huntington Beach, CA. Phone: (714) 698-0208. Local Huntington Beach Smog Station. 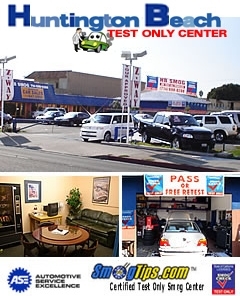 Huntington Beach's Premier... smog check test only center! Specializing in accurate and Easy-on-the-Pocket smogs! Located next to DOUGLAS NISSAN, at the Beach Blvd Car Sales Center between Warner & Slater. We smog 'em all!... diesels, test onlys, regular smog checks and gross polluters. All DMV smog checks! We can do them! Shop Hours: MON-FRI 9:00AM-6:00PM. SAT-SUN 9:00AM-5:00PM. Call for FREE pick-up & delivery! Smog Special: Get your smog test for only $31.75* with your coupon! Wow! Plus Get... 1 Free Re-Test if Needed! *Most cars. Cash only. *Add $10.00 for 1996-1999. Add $20.00 for 1995 & older. Add $10 on Sundays. More certified smog station near Huntington Beach, CA.